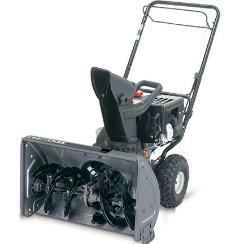 The Yard Machine Snow Thrower 62BD is one of the low-end snow throwers that will meet most consumers needs for snow clearing. 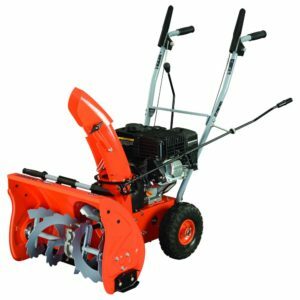 This snow thrower only has 1 forward speed, so you need to match the snow clearing speed with the depth of snow by controlling the clutch and not the gear box as in other snow blowers. This may prematurely wear out the clutch on this machine if it is not always fully engaged. It will handle up to 22 inches of snow clearing width and 21 inches of height, but you may have to stop forward motion if the machine is getting overloaded with deep snow. Everything is manual on this machine. Manual start i.e. you pull the starter chord and the chute controls are also manual. The handles fold down for storage purposes. 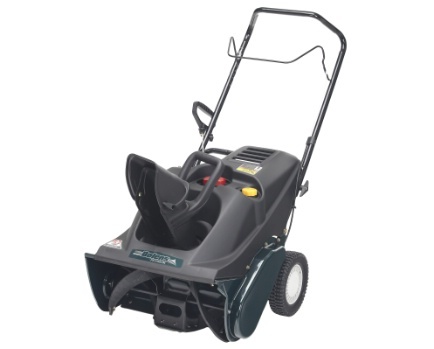 Although this is a basic snow thrower, there are less things to break down on it and if you can deal with the manual start and chute controls , this snow thrower should handle most average consumer driveways and sidewalks. If you receive heavy snow you may want to consider a larger more robust snow thrower. Most customers will have to arrange for delivery of their new snow blowers. They are far too big to take home in your car. 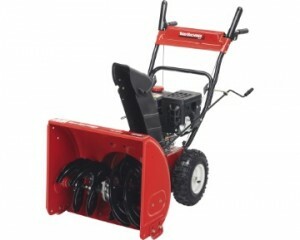 You will need a trailer, rent a van or arrange for delivery by the store that you are purchasing the snow blower from. There will be a charge for this service. But it will be the easiest way to arrange for your new snow blower to be delivered to your home. Some stores will rent their vans/trucks to you for a very low price for 2 hours. You can take your purchases home. Lowes and Home Depot do this as well as others.